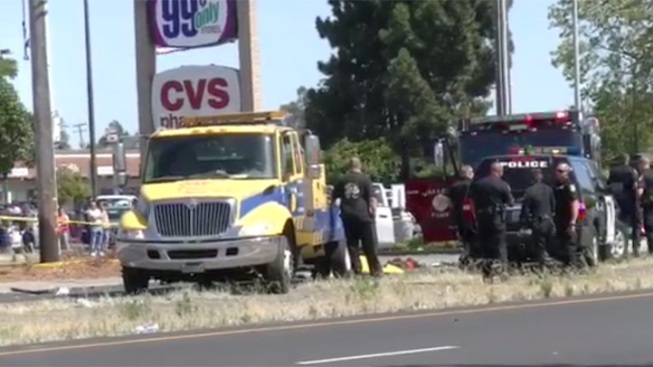 A total of six pedestrians were injured, one fatally, in a series of collisions after a driver veered on to a Vallejo sidewalk and near a bus stop Friday afternoon, police said. Vallejo police Sgt. Michael Nichelini said a man driving a Nissan Versa north on Sonoma Boulevard from Redwood Street veered off the street for an unknown reason around 3:30 p.m. The driver, a 65-year-old man from Suisun City, drove on to the sidewalk and slammed into a group of people at a bus stop, police said. He then continued north on the sidewalk, hitting a telephone pole and then a group of five pedestrians including three woman and two children, one male and one female. The car dragged two of the pedestrians north on the sidewalk before it came to a rest. One of the pedestrians who was dragged, a 49-year-old woman, was declared dead at the scene. She and the other victim stuck under the Nissan were extricated with the help of a passing tow truck driver, Nichelini noted. All of the remaining victims have been taken to hospitals in conditions ranging from critical to serious, Nichelini said. The driver of the Nissan has been detained by police and taken to a hospital for evaluation. Nichelini said it was unclear whether he was injured.